JAMM is a non-profit organization inspired by El Sistema in Venezuela, which uses music as a vehicle for social change. Through music, this program develops youth resiliency, teamwork, and self-confidence to empower, inspire and strengthen communities. 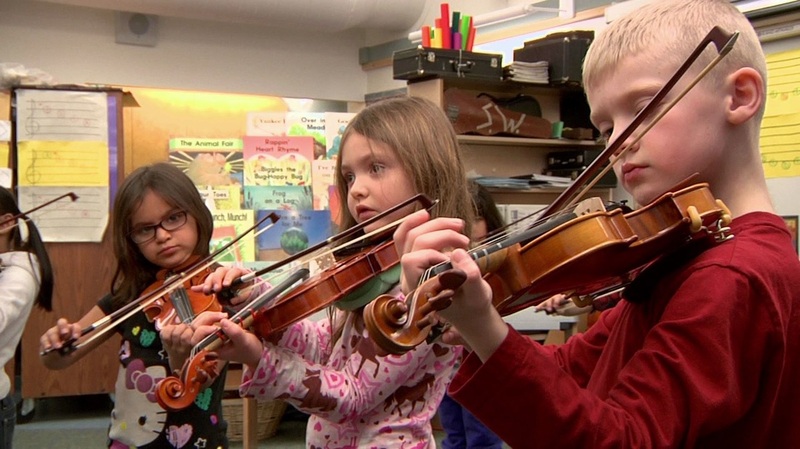 375 kindergartners and 1st graders receive 1.5 hrs/wk of violin during school hours. 225 students will participate in our after-school program. 25 concerts scheduled throughout the school year. JAMM is a tuition free music program, which helps children and youth develop focus, self-control, leadership skills, and teamwork through ensemble. Students experience success through community performance and daily practice, and understand that effort and persistence help them overcome life’s challenges. JAMM continues to serve as a nationally-recognized teacher training site and inspiration for El Sistema-inspired school models. JAMM is featured in several of the episodes produced by PBS and Annenberg Learner Professional Series called The Power of Music: P-5 Teaching Inspired by El Sistema.